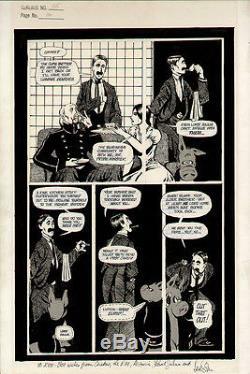 Original artwork by Dave Sim from Cerebus issue 35, page 16, the "High Society" storyline, which many consider to be the high watermark for Cerebus stories! Astoria meets with the Prime Minister and Cerebus, and Lord Julius goes on a non-stop Groucho Marx riff! This was the turnover point between the "parody of Conan" early issues of Cerebus, and the more serious stories to follow. This page is all Dave Sim, before Gerhard started doing anything with the book. Incredible crosshatching inks, with the usual zip-a-tone used for Cerebus. The person who donated this must have had it framed on their wall for a very long time, as there is a VERY slight amount tanning to the center of the page, ending where a mat frame would be, either caused by being hung in direct sun, or the previous owner was a smoker (but there is no smoke odor to the page, and it has been in a non-smoking home for the past 7 years). The closeup image gives some idea of the tanning, but it does not detract noticeably from the look of the page. If you are a fan of Lord Julius and his Groucho Marx persona, you would be hard pressed to find a page with more of that on it, reading the dialog with a Groucho accent makes it even better! Artwork is ink and zip-a-tone on 11.5" x 17.5" thick Bainbridge illustration board, and is signed To Rick - Best wishes from Cerebus, the P. Astoria, Lord Julius and Dave Sim. 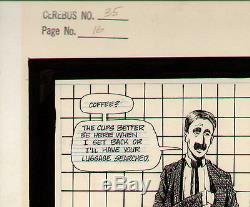 The item "DAVE SIM ORIGINAL CEREBUS PAGE HIGH SOCIETY WithLORD JULIUS / GROUCHO MARX PARODY" is in sale since Monday, October 31, 2016. This item is in the category "Collectibles\Comics\Original Comic Art\Interior Pages". The seller is "fiawol" and is located in Toledo, Ohio. This item can be shipped worldwide.